Rubadue Wire insulates a wide range of litz wires. If you’ve never heard of litz wire, don’t worry; our team is here to go over how litz wire can transform your electrical wiring solutions! Litz wire is made of several strands of enamelled magnet wires that are bunched or stranded together. It is used where losses caused by the skin and proximity effect on a single wire are too high due to the operating frequency. Litz wire reduces operating temperature, skin effect losses, and proximity effect losses by distributing the electrical current among multiple independently insulated wire strands at the same time. It has much greater mechanical flexibility than a single wire with the same cross-section. Optional Coatings: Nylon serve in single- or double-layer extruded insulations such as ETFE, FEP, or PFA. Other options are also available. Contact us for more details. Rubadue Litz Wires are approved for use with many electrical insulation systems. Please contact us for more details. Since 1977, Rubadue Wire Company has been supplying custom-engineered solutions to the electronics and magnetic winding industries. 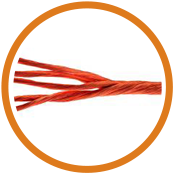 We invented the triple-insulated wire and are proud to be the industry leader in high-temperature wire and high-performance winding wire. We continue to offer innovative solutions to help designers of magnetic components meet the ever-increasing demands for smaller and more efficient products. Following our acquisition and integration of Kerrigan-Lewis, Rubadue is able to offer a wider range of litz wire products in both extruded and non-extruded options to better meet customer requirements.